We are delighted to announce that Judith Kelly has been appointed the first “SC” or senior counsel in the Northern Territory. 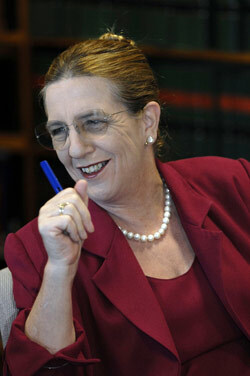 Judith was first admitted to the Independent Bar in Queensland in February 1986. She subsequently moved to the Territory to practise law where she became a partner of Morris Fletcher & Cross, Darwin (later Philip & Mitaros, now Clayton Utz). Judith joined William Forster Chambers on 1 May 1996. She was appointed Senior Counsel in September 2008. As a solicitor Judith had a commercial litigation practice with a focus on banking and insolvency and some insurance, construction and admiralty law. Major clients included the ANZ Bank, Westpac and the Trade Development Zone. She also acted for a number of receivers and liquidators and local Darwin businesses. Since joining the bar she has retained a commercial focus practising mainly in the areas of contract, partnership, building, property, tax and insolvency matters as well as some professional negligence, insurance, native title, administrative law, maritime, probate and family provision matters.